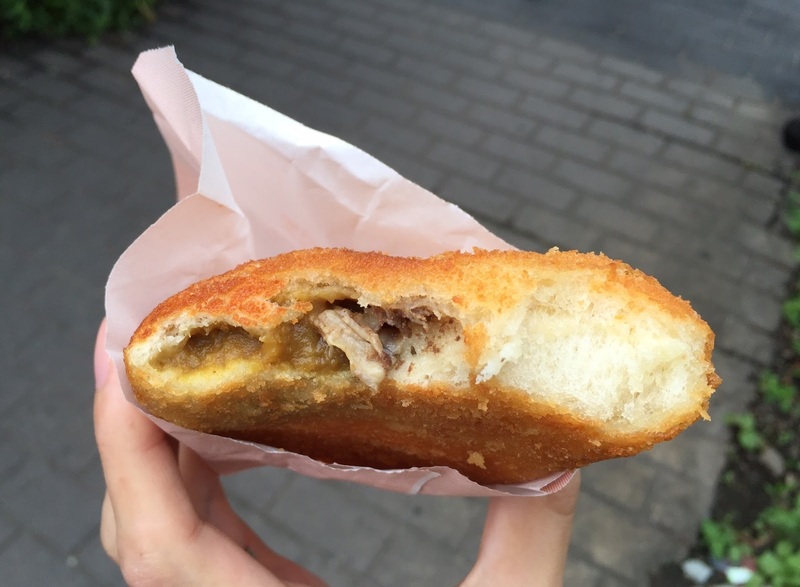 When I went on a tour to Karuizawa, Nagano, we saw a sign with Curry Bread photos. "The rare curry has now become curry bread!" Curry Bread is called "Curry Pan" (カレーパン, Karee Pan) in Japanese, and it's a bread dough filled with curry and breaded then fried, or some kinds were baked instead. The wall of the shop above the bakery said, "Karuizawa Highland Beer." We got Mikasa Hotel Curry Bread, which was no the top. Mikasa Hotel started the business in 1906 and closed in 1970, and on May 31, 1980, the architecture was designated as a cultural asset of national importance. The curry bread was perfect golden brown. It's hard to see, but there's a branded logo of Mikasa Hotel, consisting of M and H.
* Logos were shown on the curry bread on the sign. The fine breading was crunchy, the bread was soft, sweet, and chewy, and the curry filling was velvety, well seasoned and there're large chunks of beef. It's not too spicy and tasted like classic, good-old, and made-from-scratch curry. Both bread and the curry were tasty, and it's a fulfilling curry bread.